The clock is ticking, so we’ll get straight to it–time is running out to file your second-quarter 2018 941 Form. If you were wondering “when are quarterly taxes due?” the answer is…now. Your quarterly taxes must be filed by midnight on July 31. Employers must file quarterly taxes to keep their business tax compliant with the IRS. Although last-minute filing is never fun, TaxBandits provides you with resources to easily file 941 online and transmit directly to the IRS. 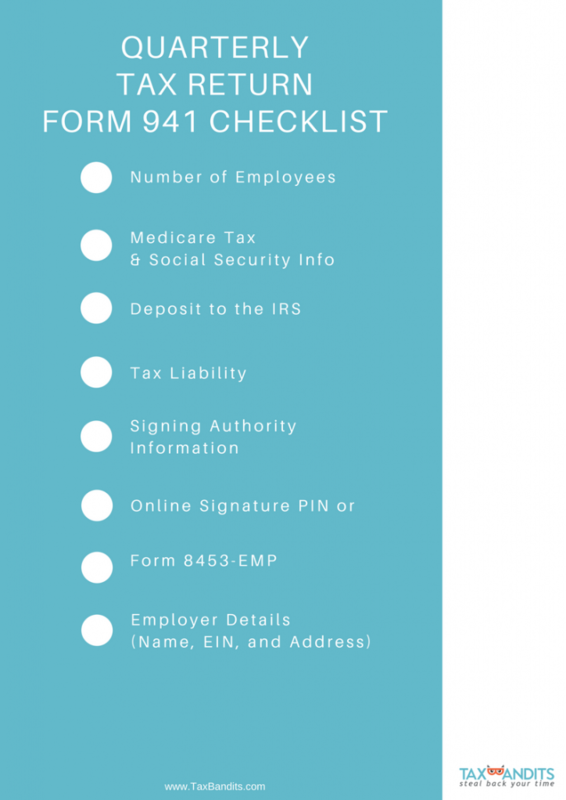 Here is the Form 941 for 2018 checklist you need to file your quarterly taxes. 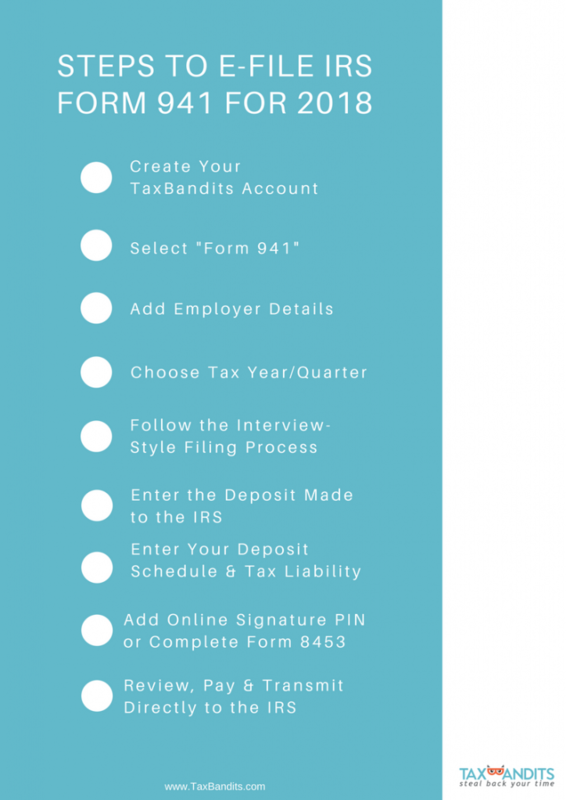 Now that you know what information is required to complete Form 941 for 2018, here is how you can easily file your quarterly taxes using 2018 941 Form with TaxBandits comprehensive tax software. If I were you, I would set aside some time today to handle quarterly taxes and avoid penalties for missing the IRS Form 941 second-quarter deadline. Missing the July 31 deadline will result in expensive penalties from the IRS, like the monthly penalty of 5% of the taxes due per month until the penalty reaches 25%. Failing to pay the taxes you owe by the deadline will cause you to be charged 2 to 15% of the total unpaid tax. The penalties depend on how many days late your payment is. Register for your FREE TaxBandits account today and avoid owing penalties at all by filing your 2018 941 Form with our simplified e-filing process. Our e-filing is quick and convenient because we know you don’t have hours to spend on tax filing. File 941 online now and meet the second-quarter deadline.